he first deliverable of WP1, D1.1, is a public report which provides a concise, bird’s-eye view of the HIT2GAP platform functionality and how HIT2GAP addresses the gap between the predicted performance and the actual performance of a building. D1.2 focuses on the technical specification for the HIT2GAP data infrastructure, led by L’Université de Pau et des Pays de l’Adour in partnership with FISE and Abo Data. This work recognises the need to consider building data and sensors in conjunction with occupier needs and activities, and relevant environmental conditions, in order to facilitate the delivery of meaningful feedback on a building’s performance. The task involved examination of the various existing data formats for describing building information, including both semantic and non-semantic approaches, concluding that ‘Industry Foundation Classes’ (IFC) an international OpenBIM standard data format, developed by buildingSMART - an open data exchange format ensuring interoperability between building information systems within the AEC industry, was appropriate for HIT2GAP. 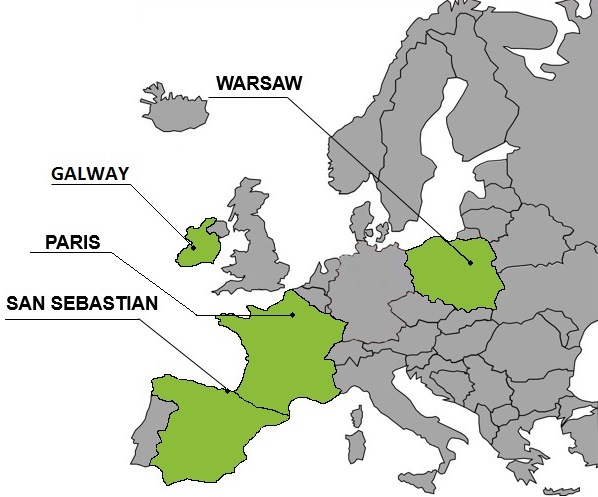 IFC has limitations, but the experience that will be gained from trialling the project’s approach on test buildings in Warsaw, Paris, San Sebastian and Galway will provide a valuable test of the success of the data infrastructure. This has led to a framework and methodology that will serve as the foundation for the next phase: mechanisms for acquiring and storing data and development of basic software architecture. Thirdly, the scenarios where FDD and forecasting tools can be applied are identified. The scenarios related to Energy Management Systems and the application of ISO 50001 are explained. Finally, the technical specifications of the HIT2GAP modules are presented. D1.4 - Although originally it was the intention of HIT2GAP to produce a specification for disaggregating end-use energy consumption, there has been a deviation from this. According to the experience of partners' involved in Task 1.3, load disaggregation methods implementing strategies for non-intrusive appliance load monitoring require consumption data sampled at low sampling rates (one second or lower). This would add the inconvenience of having to deploy specific metering systems operating at these higher sampling rates. As HIT2GAP focuses on the whole, or specific areas, of building energy consumption rather than individual loads, it has been decided that instead of focusing on load disaggregation, efforts should be made to analyse and model user behaviour and normal operating consumptions in order to detect deviations, using commonly deployed metering infrastructures. As HIT2GAP is conceived as an open platform any provider of specific modules addressing load disaggregation solutions can integrate these as external modules making use of HIT2GAP resources. This will enable energy loads to be assigned to purposes and is crucial for the provision of robust advice to building users. This task involved considering various scenarios where disaggregation could be applied. The conclusions from this will pave the way for robust energy disaggregation in both the final HIT2GAP product and in the project's four demonstration buildings. D1.5 - is a technical specification of the energy modelling approach. The proposed approach aims to isolate the most influential input parameters, and derive replacement values for them, which will lead to a better match between model predictions and observations. It also aims to identify changes that would reduce the performance gap and options for improving performance. Among the building performance simulation tools discussed in the report are: MODELICA, ESP-r, Renewable Energy Technologies (RET) and Simplified Building Energy Model (SBEM): the tools that will be applied to the four HIT2GAP pilot buildings. The report includes a review of simulation-based services, consideration of Building Performance Simulation (BPS) functionality and implementation within HIT2GAP and a technical specification for the modules related to BPS. a social context, covering group activity and social/working relationships. D1.7 - led by the Fraunhofer Institute with support from other partners, a technical specification for the HIT2GAP display modules has been developed. As a result, advanced display modules will provide the required visualisation and user-feedback to enable building-users to respond to save energy. In developing these specifications, partners considered modules that are used elsewhere, plus typical user needs in buildings and examples of industry best practice. Four data-display modules were defined, including energy- and facility- management, a building-occupant and a 3D-visualisation module. The progress made amounts to a specification that will underpin the development of the innovative display modules at a later stage in the project. D1.8, the project's Data Management Plan, prepared by Nobatek, is expected to evolve during the lifetime of the project, providing information about the data collected and generated by the project, whether and how this dataset will be shared and how the data will be preserved. An updated version of the D1.8 has recently been submitted to the EC. Decision support for renewable energy devices. The overarching objectives of the above software components will lead to a treatment of data which will enable information to be analysed and tailored for a variety of building users through a process involving real-time collection of data relating to people, energy and environments to enable simulation of scenarios, provision of essential information and visualisation of data which can easily be interpreted by those receiving it.